Staying posted with the latest news and trends is a key to success in any industry. Attending conferences is a sure fire way to do just that and more. That’s especially true if you’re in the SaaS world. Conspicuous by its insane pace and diligent workforce, the SaaS field continually rises to new peaks and attracts new eyes. Thus, it’s not surprising that this year’s calendar is filled up with SaaS conferences. Admittedly, choosing which ones to attend is an arduous task. So as SaaS enthusiasts, we’ve decided to help you out. We’re going to share with you a list of the top 5 US SaaS events of the year. These SaaS events tackle the industry from different angles and attending them serves many purposes. You can attend to look for investments or budding SaaS startups to invest in. You can also search for partners or hires. If personal growth is what you’re looking for, attending can help educate you on areas out of your expertise. No matter what exactly you’re fixing to do in a SaaS event, this list will do. As major sectors of the SaaS industry, AR and VR (collectively XR) need a standalone conference. Enter Augmented World Expo (AWE) , the supreme king of AR/VR events. From Google to Disney, plenty of huge brands have participated throughout AWE’s 10-year history. Last year, nearly 6000 attended AWE to feast their eyes on this XR spectacle. AWE has 6 stages for talks from a wide variety of XR experts. They come to share all their achievements and advances in XR. In addition, they chime in on what the future holds for XR. Moreover, the expo in Augmented World Expo is a gigantic one. Last year’s AWE boasted 100,000 square feet of exhibition space. Over 250 exhibitors got to showcase over 1000 demos. Meanwhile, entertainment is another focus of AWE with XR games and art installations. Last but not least, AWE presents its Auggie awards every year for best XR innovation in lots of categories. We at Augmania as adamant proponents of AR have been attending AWE since 2016. It’s a great immersive environment that forces you to take part in all activities. We head there to demo our Web AR platform. Yet every year we find ourselves networking, playing, and engaging in all sorts of fun stuff. This year’s AWE takes place between May 29 and 31 in Santa Clara, California. We highly recommend attending it among SaaS conferences you plan on attending this year. AWE also holds events of smaller scale called AWE Nite Meetups. These meetups are more frequent and take place all over the world. They aim to connect XR leaders of the same cities together. QCon is a unique SaaS event. For one, it’s not just one event. It’s a series of SaaS events that take place in 4 continents. Moving on, the following quote from QCon Chair Wesley Reisz explains another way QCon is unique. “If you’re looking for mostly introductory content, QCon isn’t the right conference for you”. Yes, the edge QCon as SaaS conferences have is that they are deeply technical. Selection of speakers favors practitioners over preachers. As a result, tech leads from heaps of organizations aboard the QCon stage to discuss software successes and failures. These SaaS events are designed that way to drive actionable takeaways from attendees who are also technical pros. QCon speakers always look forward to interacting with attendees and actually learning from them as well. A QCon conference usually takes 3 days with 18-21 different tracks. Among these tracks are AI, security, microservices, the blockchain, and others. The next QCon conference in the States is QCon.ai in San Francisco between April 15 and 17. If the idea of multiple tracks overwhelms you, then Business of Software is for you. Business of Software is a FOMO-less SaaS conference with a single track per conference. Particularly, the SaaS conference targets those in the scale-up process. As such, it focuses more on topics like hiring, leadership, and marketing rather than code. BoS encourages an intimate atmosphere. That’s why attendees are only around 400. Further, the SaaS conference is famous for its “legendary BoS Hallway”. It’s the place where all the networking takes place. BoS includes 14 1-hour talks from renowned speakers plus lightning talks aplenty. Lightning talks are talks by attendees. Each gets 15 slides and 30 seconds per slide to discuss topics he/she is passionate about. This year’s BoS is in Boston from September 16 to 18. While not entirely a SaaS conference, Adobe Summit still holds value to SaaS people. It’s one of the world’s grandest marketing summits with 12,000+ attendees. Generally, the sessions at Adobe Summit revolve around brand experiences. The Summit emphasizes how each individual in an organization plays a significant role in how the organization is perceived. One of Adobe Summit’s main features is its star power. Last year’s included talks from Sir Richard Branson, actress Leslie Jones, and NFL’s JJ Watt. They got to share their interesting customer experience success stories to the amusement of attendees. This year’s Adobe Summit takes place in Vegas from March 26 to 28. Arguably, SaaStr Annual is the world’s largest SaaS conference. It’s the ultimate SaaS conference to learn from SaaS unicorns and unicorns-to-be. This year, representatives from Slack, Box, and Google among others will be present. Talks will discuss everything SaaS from building prosperous SaaS businesses to debunking SaaS myths. The 3-day conference will include an incredible 40 hour+ worth of invaluable content. Among this year’s 10,000 attendees will be Augmania CEO, Rania Reda. Rania is extremely looking forward to meeting people as passionate about SaaS as she is. She is excited to share the perks of using Augmania’s Web AR platform. Most of all, she’s pumped about making new friends at Annual. So if you’re heading to SaaStr annual and are interested in Augmania, reach out and set up a meeting with Rania! SaaStr Annual takes place in San Francisco next week from February 5 to 7. Web AR is a powerful tool to engage today’s customers. It’s novel, accessible, fun, and requires no apps to start AR experiences. Sign up now to Augmania’s Web AR platform and see for yourself! Strategists define business agility as a business’ ability to adapt and lead change productively and cost-effectively without compromising quality. They enshrine business agility as the most valuable quality for any company. Let’s examine why that is the case using a little riddle. Imagine a lion, a cheetah, and an elephant fighting each other over a piece of land. Who do you think wins this one? Let your gut feelings answer. Picked a victor? Great! We’ll walk through the battle now. It took them long, but the lion and the cheetah together ravaged the elephant. Confident, the lion took it to the cheetah when something unexpected took place. The elephant’s fall created a raucous sound that terrified a co-existing cattle of bulls. Thereupon, the cattle rushed towards the felines in a scene not unlike Mufasa’s passing in the Lion King. The cheetah ran for shelter on top of a tree while the stubborn lion didn’t make a move. Eventually, the frightened cattle fled, but not before leaving the lion down, bruised, and battered. The cheetah descended the tree, delivered one last blow to the lion, and claimed its throne. At this point, you may be questioning how all that is related to business agility. Well, we can think of the sizable elephant as a grand corporation. The mighty lion represents a smaller company but with an exceptionally strong product. Lastly, the opportunistic cheetah is an agile startup with a decent product. Back to the battle. The large corporation couldn’t prevail due to its complacence. With size out of the picture, it became a war of business agility versus robust product. In a normal setting, the latter could have outlasted the former. However, the cattle turned the land into a land of VUCA (volatility, uncertainty, complexity and ambiguity). The startup with its agility adapted and won the market while the strong product yet unagile company faltered. I trust by now you’ve grasped just how crucial business agility is. Of course, real markets are a tad more complex than the land in the aforementioned story. Business agility isn’t exclusive to startups and modern enterprises. Large corporations and strong product companies too strive to become agile. That’s because no market on Earth is devoid of VUCA and no organization is immune to it. With that said, if you run a business and still haven’t established business agility, you need to act fast. Worry not about the journey to getting there, though. We’ve assembled a list of steps to help put you on the road to business agility. Buckle up! Note: These steps are not sequential. You must implement them all in parallel. To accomplish business agility, ensure you and your team are always in questioning mode. Question if your process is fully efficient. Look everywhere for things you can enhance. Even question the value of your products and the purpose of your brand from time to time. If you find any aspects that need improvement, hypothesize solutions right away. Then, let the experimentation begin. Start testing on a small scale. Invest money, time, and effort whenever applicable. Ultimately, no matter its cost, experimentation will allow you to take decisions based on facts not on intuition. Obviously, if the data from the experiments supports your new solutions, implement them immediately. Yet how you react when data doesn’t support proposed changes is a major test of your business’ agility. Deeming the entire process from the get-go a failure means you score low for business agility. Alternatively, think of the process as a learning experience. All cheesiness and Arnold Schwarzenegger quotes aside (no offense, Arnie), it literally is a learning experience. The knowledge you and your team gain will level up your decision-making moving on. Not to mention, the produced data is a treasure that you can utilize later on in other ventures. I’d be remiss if I don’t mention that you must run the above process for each hypothesis separately. At the very least, don’t test hypotheses that may impact each other at the same time. That kind of harmful multi-tasking doesn’t mix with business agility. One of the main goals of business agility is to simplify. Period. Without a doubt, business agility calls for simplifying more than just experimentation. Simplifying is a holistic approach that applies to all of an organization’s operations. One part of it is breaking down goals into clearer objectives. These objectives are less hardly managed. Furthermore, the completion of each objective becomes a feedback checkpoint as well as motivation for teams. Another complexity business agility necessitates gets simplified is multi-layer management. Having many 2-3 people teams with their own managers is toxic. The managers will always be inclined to add value even when unnecessary. This bureaucracy can be a hit to team morale. There are lots of other areas for simplification. For example, you can simplify how your employees sign off arrival and leaving times. At times, when a task is giving your team a hard time, outsourcing may be a means of simplification. Try to hold fewer meetings. Look at your own daily routine and simplify it. Basically, if you want to bolster business agility, simplify everything in sight! A prime obstacle to business agility is what’s known as a handoff. A handoff is when people from different teams work on the same task, but without communicating together. Consequently, each team optimizes the work from its perspective without thinking of the other. The end result is misunderstandings, conflicts, and mistakes galore. Putting your customers at the center of all your brand’s initiatives is a fundamental step to business agility. In a brilliant presentation,, Paul Cobban, the COO of DBS bank (the best digital bank of 2018), addressed this matter. At one point, DBS wanted to improve its call center service. So they decided to change all the scripts of their call center agents. Specifically, they changed how agents speak to customers who had just lost their debit cards. This is usually accompanied by a loss of other valuables. To sympathize with such callers, agents don’t opt for an identity-confirming procedure right away like they did before. Instead, they first apologize about the stressful experience of losing valuables. Then, they smoothly explain the procedure in full before running it. At the end of the call, they provide callers with useful numbers they could use in such situations. Appropriately, DBS’ customer satisfaction scores “went through the roof”, to quote Cobban himself. This customer satisfaction will surely back DBS up if the bank ever stumbles with VUCU issues. Therefore, empathizing with customers is an excellent way to achieve business agility. You know how else you can empathize with your customers? By engaging them in new ways; using new tech, for example. And what better tech to use in engaging audiences than Augmented Reality? With its merging of realities, it provides the perfect balance between new and familiar. Moreover, AR is accessible, inexpensive, and ultra fun! Your prospects will notice and appreciate that you’re using revolutionary AR only to spark their attention. Your marketing will be a far cry from that of other brands using traditional marketing tools. Thus, it’s a no-brainer that you’ll have your customers’ backing after that. That is, more business agility for you! Want to know more about the wonders of AR? Sign up now to Augmania’s frictionless DIY Web AR platform. It’s the ultimate haven for the content enthusiast inside of you! When QR codes first hit the marketing town, everyone thought they’d be every marketer’s best friend. especially that they connect on-ground marketing to digital marketing. Overall, QR codes are scanned fast and trackable. Most importantly, they are considerably inexpensive. On paper with all these qualities, it seemed that QR codes would brew quite the marketing insurgency. However, here we are years after the arrival of QR codes, and the insurgency hasn’t really taken off. This has created a grand debate between tech aficionados on whether or not QR codes are already dead. On one hand, statistics aren’t doing QR codes much favor. A 2012 study by comScore revealed that the number of US QR code scanners had reached a plateau. Another recent study by Statista in 2018 projects an increase from 9.76M to 11M scanners in 2020. That increase is not a drastic one, especially when you account for the increase in smartphone owners. On the other hand, titans such as Coca-Cola still utilize QR codes regularly to communicate with their customers. At Augmania, we have given this debate much thought. Our verdict is ready. We believe that QR codes are alive and well. We just think that not many marketers use them efficiently. That’s why we’ve come up with 5 tips to help you master the use of QR codes. Who doesn’t own one of these? Accordingly, brands should place their QR codes in well-covered areas. Less of an issue now as iPhone users of iOS 11 and beyond have built-in scanners. Now that’s the real culprit. If you plan to use QR codes to merely get scanners onto your website, then spare yourself the cost. Many marketing gurus affirm that it’s not about unlocking destinations with QR codes. It’s more importantly about unlocking content. Let’s think it through: If a potential customer decides to scan your QR code, chances are he/she is expecting something special. As such, if customers wanted your website or contacts, Googling it would be less tedious than scanning codes. Hence, you should reward your customers’ curiosity. For a starter, you can do that by providing them with valuable content. It doesn’t have to be exclusive and only accessible through the QR codes. The content just must be helpful to them in the context they’re at. For example, if customers are on the verge of a purchase, direct them to reviews through your QR codes. Duly, think of what content will aid your customers in whichever marketing funnel phase they’re at. Unfortunately, acing QR codes content is almost worthless without one more tiny thing. You need to elaborate to your customers on what exactly scanning the codes does. Even a simple ‘Scan Me’ note is not enough. So be generous and share the knowledge you are offering with your audience. No need for a copywriter to pull that off. Traditional QR codes are far from visually appealing. They may even deter less tech-savvy customers from your brand. Thankfully, there are many QR code generators now that allow you to design your own codes. One way to use it is by inserting your logo onto the QR codes. Alternatively, you can color the code with your brand’s color scheme if it’s popular enough. Such a minimalist approach would work great in teaser campaigns. There’s more to the creative work done with QR codes than you expect! It’s possible to turn your code into an artwork amidst the process. Yet in that case, mentioning that you’re using a QR code and mentioning its purpose becomes extra important. Now you’ve created relevant QR code content and then made your codes look beautiful. There’s no reason not to brag and have large QR codes on your flyers, posters, business cards, products, etc. That way you ensure that both prospects and their phones can detect your QR codes. The general rule goes: Scanning Distance= 10x the QR Code Size. Still, having large QR codes have contributed no harm to QR code campaigns. Well, you know what they say about size, though. It’s not everything. So, please, help me scream that at Portugal’s Azores Airlines! The last thing you’d want is for your QR codes to be huge but unreachable. Thus, strategic code placement is crucial. Remember when we said you had to reward code scanners for their curiosity? Landing them onto a desktop-only webpage tarnishes this curiosity. It leads to a disappointing experience that may prevent these customers from ever dealing with your brand again. Thus, customizing your QR code content for smartphones rids you of such worry for good. Though to be honest, you can do better than just mobile-friendly pages. Much better, in fact. And that’s where Tip #5 comes in. In order to scan codes, prospects utilize their phone cameras. Now, If your code leads to a mobile page, then it’d take them into a new virtual medium. I say why the hassle? Instead of dissociating scanners from their realities, you can simply augment them using AR. Essentially, scanners will still see the same views from their cameras, but with your content layered on it. A campaign by Poland’s Sukiennice museum brilliantly integrated AR into QR codes. After years of renovation, the museum was reopened with a new focus. Its personnel wanted to attract youngsters who weren’t normally fascinated by what the museum had to offer. So, they came up with a solid idea to turn the museum’s artworks into live short performances. The performances pitted the artists telling the stories of their own masterpieces in AR. After scanning QR codes, visitors could see these performances through their phones as if the artists were right in front of them. The result? A mesmerizing experience and over 20% of Krakow’s population visiting Sukiennice. It was truly a QR AR miracle. Evolution epitomizes our universe. Out of all dynamic elements surrounding us humans, it’s perfectly logical that technology is among the most rapidly evolving. While some tech has changed how we live (smartphones and whatnot), other has taken a turn for the strange. Calling these products strange is in no way an insult, though. Strange here can mean that a product is of unorthodox functions or relatively limited usability. It also refers to products that feel futuristic or even downright out of this world. Each is strange in its own unique way. Yet who knows? Many essentials of our daily lives were once called strange. NY Times called cars impractical in 1902 and now it has an entire section for automobile news. So here are 7 of the strangest tech items marking our century. Folding clothes is one arduous process that humanity, for some reason, hasn’t devoted any time to easing. That is until Foldimate emerged on the strange tech scene. 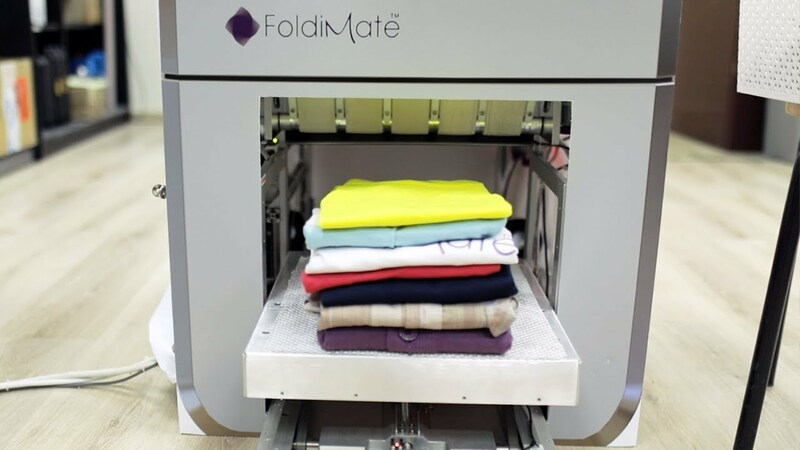 As you’ve already guessed, Foldimate is a bot that folds apparel for you. Some skeptics think it’s an unnecessary luxury, but I’m sure the first automatic washing machine had its detractors as well. Foldimate has its downsides, though. The biggest is that users have to insert every clothing item into the machine. Still, Foldimate does its job in roughly five minutes while mechanically folding clothes can take much longer. Another downside is that Foldimate doesn’t fold small items like baby clothes or large items like bedsheets. It’ll launch this fall at an expected price of $980 which is a hefty investment for families. AEE Selfly is a dream come true for all lousy selfie takers. It goes much further than just that too. Selfly is a flying drone camera. That’s not unheard of. We’ve seen similar devices used in security and event management. What’s unheard is that Selfly is also a phone case. That’s right, it’ll fly with you wherever you go as it fits any 4-6 inch smartphone. This accessibility opens up a whole new market for the drone camera. It will attract pro and, more importantly, casual photographers. They’ll use the 13MP camera to document adventures, gatherings, and other special moments like they never did before. So Selfly may be strange tech now, but its future looks to be fairly bright. It’s available now for ordering at $100. Our next esteemed strange tech board member is for everyone afraid that soulless machines will take over Earth soon. Soulless machines won’t take over Earth……..on their own. There’ll be soul-filled ones too! Like piBo! piBo is essentially a walking Alexa. It can set reminders, give weather briefing, play music (and dance to it), and do all the Alexa stuff. The one edge piBo has over Alexa (apart from its cuteness) is that it offers personalized experiences. piBo has a camera that helps it recognize different users. Thus, it’s loyal to its owner. It’s also said to somehow recognize feelings and reacts accordingly. I sort of understand some people aren’t ready yet to transition from owning pets to owning Qoobo. For these people and especially dog owners, Laika is ready to be a companion to your bowwows! It’s equipped with a camera, a microphone, speakers, and even a treat thrower. You can control it to play with your dog whenever you’re away from home. Most impressively, if you’re a busy while away and your dog is feeling extra energetic, Laika can keep it entertained. That’s by virtue of Laika’s autonomous mode. The mode detects motion and allows Laika to play with your dog even if you’re not controlling it. If you don’t find Laika strange tech, it’s up for pre-order at $325. Though Kevin looks like fancy speakers, it’s much more than that. Kevin utilizes an extraordinary approach to home defense. It emulates humans to deter any burglars. It’s loaded with dialogue about different subjects that will sound like actual people conversing to intruders. There is weeks worth of dialogue in Kevin too to prevent burglars from noticing any loops. Furthermore, Kevin manipulates light and creates shadow effects. Gone are the days of leaving the lights or TV on when leaving home. Kevin’s available for sale online for $285. 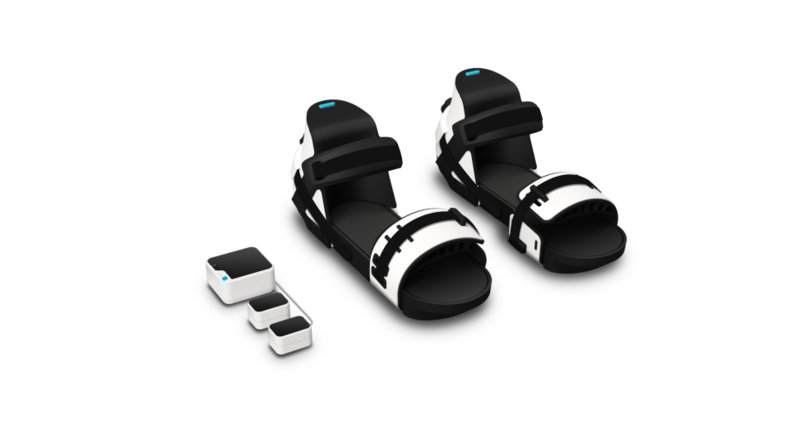 Taclim is the world’s first ever VR shoes. It creates wholly immersive VR experiences. Using Taclim while in a VR environment, you’ll sense differences when you walk over sand, grass, rocks, etc. In combat games, if your character takes damage to the legs, Taclim will generate pain-like sensations. Taclim is not used for games only, though. Its developers say it’s for ice skating ring owners to showcase their business to others without getting on ice. That seems rather super specific. Nonetheless, it’s sweet of the Taclim people to have thought of ice skating ring owners as they developed Taclim. I guess. With too many entertainment streams, brushing teeth can be a boring chore for today’s kids. Magik changes all that. 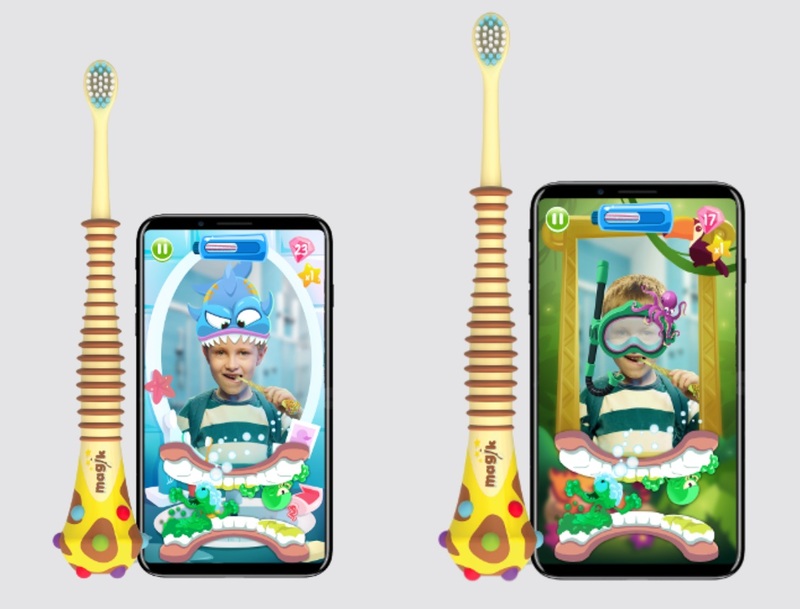 It’s a toothbrush paired with a mobile app that uses AR to make brushing teeth a mighty fun experience. It comes with 15 different games. In one of the games, as kids brush they shoot a cavities-spreading monster. Magik also teaches children to brush correctly and allows parents to monitor their brushing patterns and progress. Call it strange tech if you want. But Magik helps maintain good habits and that is what all tech should aspire to do. You’ve seen the strange side of AR. It’s time to see its revolutionary side; the side that has taken over marketing, print, education, and other industries. Sign up to Augmania’s AR platform now and create AR magic yourself!